The latest fee schedule is available by contacting the USPTO at 1-800-PTO(786)-9199 or (571) 272-1000, or on the USPTO webpage at www.uspto.gov. 37 C.F.R. 1.22 Fees payable in advance. (a) Patent fees and charges payable to the United States Patent and Trademark Office are required to be paid in advance; that is, at the time of requesting any action by the Office for which a fee or charge is payable with the exception that under § 1.53 applications for patent may be assigned a filing date without payment of the basic filing fee. (b) All fees paid to the United States Patent and Trademark Office must be itemized in each individual application, patent, or other proceeding in such a manner that it is clear for which purpose the fees are paid. The Office may return fees that are not itemized as required by this paragraph. The provisions of § 1.5(a) do not apply to the resubmission of fees returned pursuant to this paragraph. 37 C.F.R. 1.23 Method of payment. (a) All payments of money required for United States Patent and Trademark Office fees, including fees for the processing of international applications (§ 1.445 ), shall be made in U.S. dollars and in the form of a cashier’s or certified check, Treasury note, national bank notes, or United States Postal Service money order. If sent in any other form, the Office may delay or cancel the credit until collection is made. Checks and money orders must be made payable to the Director of the United States Patent and Trademark Office. (Checks made payable to the Commissioner of Patents and Trademarks will continue to be accepted.) Payments from foreign countries must be payable and immediately negotiable in the United States for the full amount of the fee required. Money sent to the Office by mail will be at the risk of the sender, and letters containing money should be registered with the United States Postal Service. (b) Payments of money required for United States Patent and Trademark Office fees may also be made by credit card, except for replenishing a deposit account. Payment of a fee by credit card must specify the amount to be charged to the credit card and such other information as is necessary to process the charge, and is subject to collection of the fee. The Office will not accept a general authorization to charge fees to a credit card. If credit card information is provided on a form or document other than a form provided by the Office for the payment of fees by credit card, the Office will not be liable if the credit card number becomes public knowledge. (c) A fee transmittal letter may be signed by a juristic applicant or patent owner. (c) If the Director decides not to institute a reexamination proceeding in response to a request for reexamination or supplemental examination, fees paid with the request for reexamination or supplemental examination will be refunded or returned in accordance with paragraphs (c)(1) through (c)(3) of this section. The reexamination requester or the patent owner who requested a supplemental examination proceeding, as appropriate, should indicate the form in which any refund should be made ( e.g., by check, electronic funds transfer, credit to a deposit account). Generally, refunds will be issued in the form that the original payment was provided. Where the Office has notified an applicant, in writing, that a fee is due and has specified a particular dollar amount for that fee, if the applicant timely submits the specified fee amount in response to the notice, the applicant should be considered to have complied with the notice so as to avoid abandonment of the application. If the fee paid by the applicant is insufficient, either because the notice specified an incorrect dollar amount for the fee or because of a fee increase effective after the mailing of the notice and before payment of the fee by the applicant, the applicant should be notified in writing by the Office of the fee insufficiency and given a new time period in which to submit the remaining balance. The written notification of the fee insufficiency should set forth the reason (i.e., the fee amount indicated by the Office in the earlier notice was incorrect or the fees have increased since the earlier notice was mailed) why applicant is being required to submit an additional fee. 37 CFR 1.22(b) sets forth that fees must be itemized in such a manner that it is clear for which purpose fees are paid. The Office may return fees that are not itemized. The intent of the fee itemization requirement is to encourage a better explanation by applicants of how fees being paid are to be applied by the Office. This will allow Office employees to properly account for the fees being paid by applicants. It should be noted that the language of 37 CFR 1.22 is not intended to create a problem when it is clear what fee is needed. A reference to "filing fee(s)" would be sufficient to cover filing fees (including search and examination fees) of all different types of applications and all types of claims. Further, in a paper submitted on a date later than the actual filing date, the reference to "filing fee(s)" would also be sufficient to cover the surcharge under 37 CFR 1.16, as the surcharge is also required to make the application complete. A reference to "any corresponding fee under 37 CFR 1.16 " would be sufficient to cover any fee (e.g., surcharge, application size fee, excess claims fees) under 37 CFR 1.16. In a petition for an extension of time filed without a specifically itemized fee, but with a general authorization to charge a deposit account, it is clear that a fee for an extension of time is needed and the deposit account should be charged the appropriate extension of time fee. (8) the excess claims fee (37 CFR 1.16(h), (i), and (j) ). (3) the late filing surcharge (37 CFR 1.16(g) ). See also MPEP § 607. 37 CFR 1.23 permits payment of any patent process fee, trademark process fee, or information product fee by credit card, subject to actual collection of the fee. The Office currently accepts charges to the following credit cards: AMERICAN EXPRESS®, DISCOVER®, MASTER CARD®, and VISA®. Credit Card Payment Form (PTO-2038) should be used when paying a patent process or trademark process fee (or the fee for an information product) by credit card, unless the payment is being made using the Office’s electronic filing systems. The credit card payment form is not required (and should not be used) when making a credit card payment via EFS-Web or other electronic filing systems. Form PTO-2038 may be downloaded at www.uspto.gov/sites/default/files/ documents/PTO-2038.pdf. The Office will not include the Credit Card Payment Form (PTO-2038) among the records open to public inspection in the file of a patent, trademark registration, or other proceeding. The Office does not require customers to use this form when paying a patent process or trademark process fee by credit card. If a customer provides a credit card charge authorization in another form or document (e.g., a communication relating to the patent or trademark), the credit card information may become part of the record of an Office file that is open to public inspection. Thus, failure to use the Credit Card Payment Form (PTO-2038) when submitting a credit card payment may result in the credit card information becoming part of the record of an Office file that is open to public inspection. Credit card payments by facsimile are permitted, except in situations in which facsimile submission of correspondence is not permitted in 37 CFR 1.6(d). Credit card payments that are not being made via the Office’s electronic filing systems (e.g., EFS-Web, the Electronic Patent Assignment System (EPAS), or the Finance On-line Shopping Web page for patent maintenance fees), may only be submitted with a handwritten signature personally signed in permanent dark ink or its equivalent by that person. See 37 CFR 1.4(e). 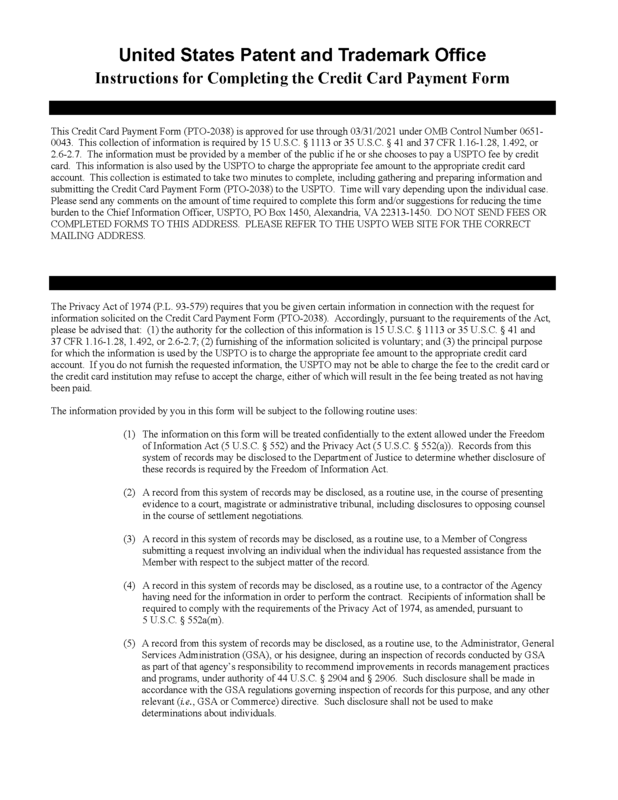 Such payments may not be signed using an S-signature as provided for in 37 CFR 1.4(d)(2). A handwritten signature is required (i.e., an S-signature is not permitted) only when the credit card payment is being made in paper and thus the Office’s Credit Card Payment Form (PTO-2038), or an equivalent, is being used. A credit card payment via facsimile is considered a paper submission and requires a handwritten signature. Form PTO-2038 (or an equivalent) should not be filed via EFS-Web. 35 U.S.C. 42(d) and 37 CFR 1.26 (which concern refund of patent and trademark fees) also apply to requests for refund of fees paid by credit card. Any refund of a fee paid by credit card will be by a credit to the credit card account to which the fee was charged. See 37 CFR 1.26(a). See MPEP § 607.02 for returnability of fees. Any payment of a patent process or trademark process fee by credit card must be in writing (see 37 CFR 1.2 ), and preferably submitted via the appropriate Office electronic filing system, or if filed in paper, on the Credit Card Payment Form (PTO-2038). 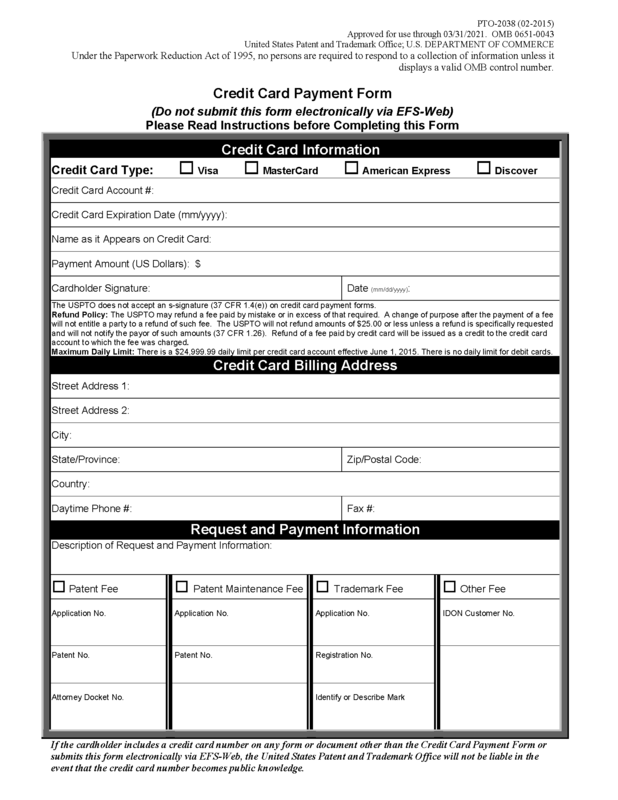 If a Credit Card Payment Form or other document authorizing the Office to charge a patent process or trademark process fee to a credit card does not contain the information necessary to charge the fee to the credit card, the customer must submit a revised Credit Card Payment Form or document containing the necessary information. Office employees will not accept oral (telephonic) instructions to complete the Credit Card Payment Form or otherwise charge a patent process or trademark process fee (as opposed to information product or service fees) to a credit card. 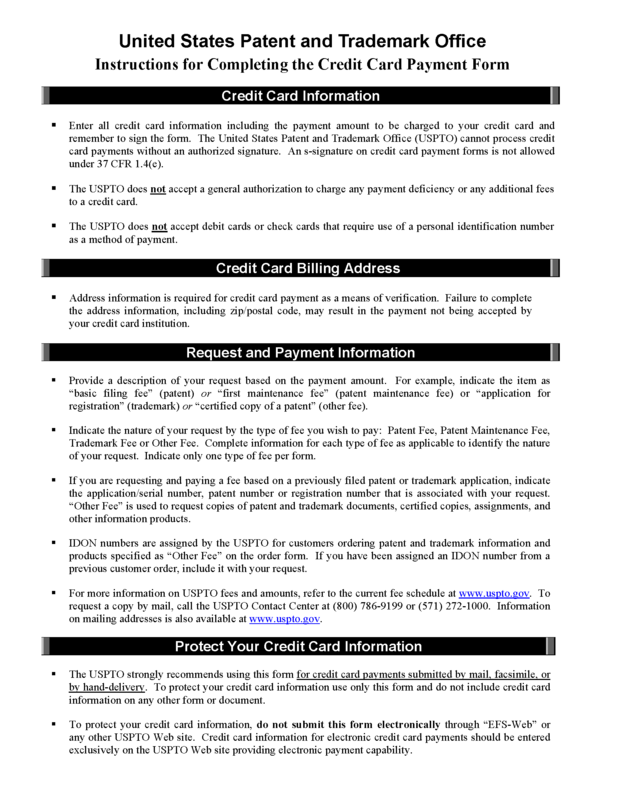 Credit card payment submissions made on the USPTO website at www.uspto.gov must include the 3-digit or 4-digit security code associated with the credit card in addition to the credit card number. The security code will not be required when the paper Credit Card Payment Form (PTO-2038) or other written authorization is submitted. The security code is part of an authentication procedure established by credit card companies to further efforts towards reducing fraudulent or unauthorized credit card use for Internet payment transactions. The security code must be entered at the time of the Internet payment transaction to verify that the physical card is in the cardholder’s possession. The security code appears on all major credit cards and is not part of the credit card number itself. Each credit card company has its own name for the security code (such as CVV, CVV2, CVC2 or CID), but it functions the same for all major card types. On DISCOVER®, MASTERCARD®, and VISA® credit cards, the security codes is a 3-digit code that is printed on the back of the card, often following the credit card number digits. For AMERICAN EXPRESS® credit cards, the security code is a 4-digit code that is printed on the front of the cards. If you cannot read the security code, you will have to contact the financial institution that issued your credit card.